Remington's stocking has arrived! 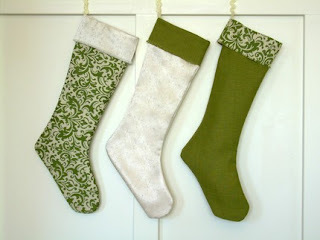 I ordered these stockings for Jon and myself last year from etsy. (The ones on the left and right). I wanted Remi to have his own pet stocking (it's a tradition in my family), but I was having trouble finding something that would match ours. Then I found Pottery Barn's pet stockings. They are cream and made of faux-sheepskin. It was perfect. I got his name monogrammed in a similar green to match and I can't wait to put them all up together. Now I just have to figure out where to hang them since we don't have a fireplace. I'm thinking about hanging them from the standing mirror in the living room, one of the shelves on our ladder bookcase or the floating shelf in our dining room. I can't wait to decorate for Christmas! I've been buying stuff for years (I think we have 5 boxes of Christmas stuff) dreaming of the day when I'd have my own home to put it all up in. And now I do!